Still Life with Flowers. 18' x 32'. 2018. Let Dreams Soar. 45' x 30'. 2017. Shapeshifter. 15' x 9'. 2017. Leaving. 12' x 44'. 2017. Peace Begins on Your Plate. 40' x 12'. 2017. Good Evening. 50' x 12'. 2017. Vanport. 18' x 50'. Fremont and Vancouver. Spraypaint. 2015. Dreaming of Kelley Point. Mural at Brass Tacks in St. Johns. Acrylic. 20' x 40'. 2015. Saw Mill. St. John's Mural at Urbansphere. Spray paint. 2015. 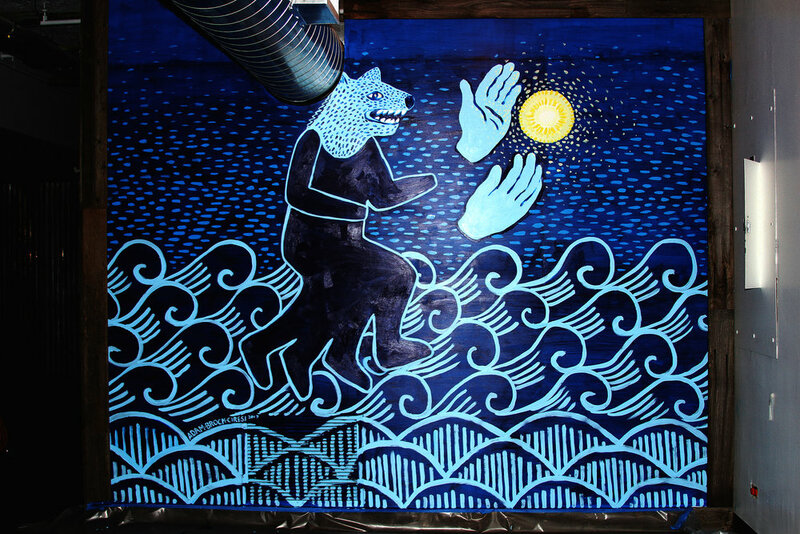 Open Hand Mural. 14' x 16'. 2018. The Leap and Heap of Humanity. PSU. Spray paint. 18' x 50'. 2013. Koken Market mural design. Spray paint. 20' x 40'. 2013.